Matt Zimmerman, 25, an actuary, lives in Ukrainian Village and was drinking beer at SmallBar Thursday with his friend, David Wiegard, 26, a consultant. LINCOLN PARK — The next week and a half will showcase Chicago's booming craft beer industry with events in Lincoln Park ranging from tap takeovers to a prehistoric beer prom. The fifth annual Chicago Craft Beer Weeks kicks off May 15 and runs through May 25 with nightly events at bars, restaurants and breweries in the neighborhood and across the city. For the beer makers, its a chance to show off new rare brews and join up with other Chicago breweries. It is also an opportunity to give beer novices a chance to learn a bit about local brews and try them out for what is often the price of a domestic bottle. "It's kind of like subbing out a Miller Lite with a pale ale," said Justin Maynard, executive director of the Illinois Craft Brewers Guild. 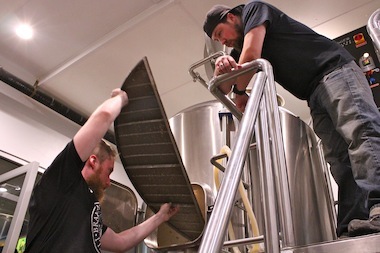 Nate Albrecht, top, of Aleman Brewing, looks on as Ben Saller cleans a tank at Atlas Brewing. When Maynard took over the executive post a little more than two years ago, Chicago Craft Beer Week was still finding its identity. Half Acre and Revolution Brewing had recently opened their brewpubs, and Haymarket Pub & Brewery was still in the planning phase. "Craft beer in the city, it's just blown up and grown exponentially," Maynard said. Two years later, there are more than 40 breweries in the planning this year and probably 40 next year, according to Maynard. More than 300 venues are expected to participate in this year's Chicago Craft Beer Week, which coincides with the American Craft Beer Week. The number of local brew houses participating doubled from 2012 to 2013 and is expected to double again this year. Maynard expects the number of events to triple again this year, as it did from 2012 to 2013. "The people have spoken. They want local beer," he said. The minimum requirement to host an official craft beer week event is to offer a $4 pint, but most participating establishments have gone far beyond that. Standard Market Grill is hosting a week-long city vs. suburbs throwdown starting May 19 pitting city-based Revolution, Half Acre and Begyle against suburban breweries Solemn Oath, Buckledown and Two Brothers. The Beer Bistro is hosting a micro-waste micro-brew event May 21 to educate drinkers and fellow brewers on sustainable practices while sipping rare beers from Goose Island. Lincoln Park's Atlas Brewing Company will not only be hosting its second annual craft beer prom, with a dinosaur theme, but will be hosting a different event every night of the celebratory week. Those events range from a crawfish boil beer-paired dinner to a barrel-aged quad road trip to a suburban distillery, and a home-brew workshop. "It's promoting craft beer and celebrating the pretty amazing rapid evolution that's occurred in Chicago in the past few years," said Ben Saller, Atlas's co-founder and co-brewmaster alongside his brother John. The prehistoric beer prom will be held at Atlas's neighbor Seven Ten Lounge, 2747 N. Lincoln Ave., on May 17. The brewery is running a crowdfunding campaign to purchase giant inflatable dinosaurs for the party, and currently have enough for at least one nine-foot tall T-Rex. There is a camaraderie to Chicago's thriving beer scene and the celebratory week is a time for brewers to join heads to rare concoctions. "People just get excited about celebrating a high-quality interesting product that happens to be alcoholic," Saller said. Atlas, for example, is working on a collaboration with Aleman Brewing. It was a chance for the minds behind Aleman to work alongside the Saller brothers before their own brewery opens sometime this summer. The Atlas and Aleman single malt, single hop Extra Special Bitter named "Saphir and Loathing" will be released at the brewery May 22. Aleman's brewers worked alongside the experienced Atlas Brewers taking notes on the step-by-step week-long process that requires precise timing to the minute. Aleman had the chance to also work with Stone Brewing Company on a collaboration in 2013, learning from one of the most highly respected breweries in the process. "It's kind of like standing on the shoulders of giants," said Nate Albrecht, a co-founder of Aleman. With an expected 300 events around the city, the week not only gives new craft beer drinkers an introduction to the beverages, but provides connoisseurs incentive to visit Chicago's neighborhoods in search of unique offerings. The theme of the week is "Chicago: A City of Neighborhoods." "It's about going from Wicker Park to the West Loop and coming down and walking up and down Madison and trying different beers in different bars and experiencing the city," Maynard said. 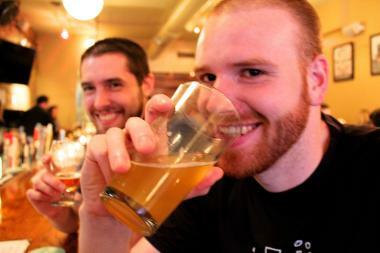 A full list of Craft Beer Week events is available at www.chibeerweek.com.